word, serving, and fellowship, we can encourage you in a relationship with Jesus focused on His will and His character. For more information, email ministry leaders Kyle and Michelle Skinner by completing the email form below. 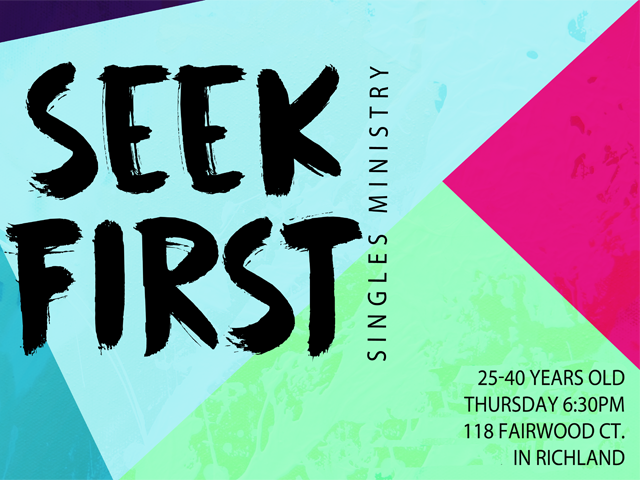 Seek First meets on Thursday Nights at 6:30p. We invite singles ages 25 - 40 to join us at the Skinner's Home at 6:30 for dinner and at 7p for Worship & Bible Study. Kyle is currently teaching through the book of Romans. Don't miss out!